Is fighting with my wife ruining my kids? 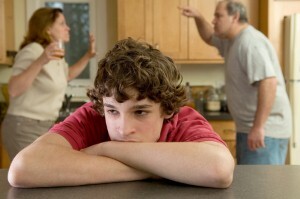 Home » Dad » Is fighting with my wife ruining my kids? Every marriage has its problems. What's a relationship without a little passionate fight and make-up? But if you and your spouse are fighting in front of the kids, consider the lessons you're teaching your youngsters about relationships. Although it's tough to control your anger sometimes, experts say that it's important to show your children the love and respect in your marriage more often than you show them the irritation and difficulty. According to the U.S. Department of Health and Human Services' Administration for Children and Families, having a positive relationship with the mother of your children is one of the most important ways you can show your kids how to have functional social interactions of their own. "Fathers influence their children in large part through the quality of their relationship with the mother of their children," the organization reports. "Fathers who treat the mothers of their children with respect and deal with conflict within the relationship in an adult and appropriate manner are more likely to have boys who understand how they are to treat women … [and girls who] are less likely to become involved in violent or unhealthy relationships." In other words, you and your wife are modeling a relationship for your kids – and if you don't show them how to interact successfully, they may never learn. Of course, that doesn't mean you can never get angry. But when you and your wife fight, being mature, calm and respectful will allow you to serve as an example for your children.